Spurred by angst over the continued waste of federal funds on a failed Bureau of Land Management (BLM) agenda of illegally removing native wild horses and burros from public lands and the state of Oklahoma’s newly acquired blood lust for slaughtering America’s horses several equine welfare groups, and their members, will be staging a press conference and rally in opposition to the BLM’s Advisory board meeting to be held on March 4th in Oklahoma City, Oklahoma. The BLM board will be receiving public comments at 3:30 PM, directly after the press conference and rally; advocates and concerned Americans are urged to comment or view. Registration for comments concludes at 2:00 PM and the BLM will be restricting speakers to 3 minutes or less. See you there. We will be the Rainbow Meadows Equine Rescue group of 3. They will hear but will they listen? I truly appreciate all who are taking the time and investing the money to speak for our wild horses and burros at this event. The Advisory Board is so packed with special interest’s members it’s obvious the only reason they hold these meetings is because it is required not because they want anyone else’s opinion. They are demagogues who consider themselves the ultimate authority. If I had one wish it would be that someone during the public comments will demand the resignation of this entire board for their lack of leadership and appropriate management skills. Especially Boyd Spratling who I believe was the one pushing them to think about slaughter facilities on Indian reservations. There is not one member on that board currently who is worth the powder it would take to blow them up. They all need to go. There need to be more seats for the public interests, after all we own those horses and burros, and fewer for the cattlemen. Good Luck to all and thanks again for what you’re doing! Be there! Wyoming Advocate. In route. Denver! I hope viable alternatives will be discussed. One board member just said that ‘mares’ have to be the ‘target gender’. Deb Coffey did a great talk after the press conference about the discussion this statement just came out of. Why would that not be true? Tomorrow the voices of truth , love and reason will be heard Loud and clear I wish I could there !!! I will be online watching!!!!! May the force of the Horse be with all !!!!!!! From the advocates’ lips to God’s ears. Godspeed! The wild horses are your horses, they do not belong to the BLM, they are yours. When someone sells one to slaughter, or buys one for slaughter, they stole your horse, which, because it’s health history is not known for certain, is not acceptable to be entered into the food supply, and, they illegally entered said questionable meat into the food supply. This is criminal acts on many levels, the government has full knowledge of the ongoing criminal activity, and yet… nobody’s getting prosecuted… Why do you think that is? Last year I has occasion to watch two horses I am very close to be stolen, and attempts made to enter said stolen horses into the food supply system. The local police and prosecutors in this state, and the state where the horses were illegally transported to, the FBI, I assume the US Prosecutor’s office, the U.S.D.A., the FDA, had full knowledge, including full knowledge of the fact that these horses were not suitable to be entered into any food supply, and they did nothing. Well, they did do something… They actually served to enable the horse thieves to get away with poisoning some innocent people with stolen, tainted horse meat. In the mean time, if you do your research, find some cows getting clean, natural foods, and get clean, pure, unpasturised milk to feed to your kid, you may, and the farmer WILL be prosecuted. The folks who you are thinking of as “your government” are running their own little mafia, and the ones who pay their tithe to the godfather can do whatever they want to you, and your kids. You folks have been succesfully devided into a small, ineffective group who is being easily dealt with, worrying about one issue while you’re being attacked on every front. There’s strength in numbers, please consider joining up with others to make your numbers large enough to become effective. Curtis, if you’ve read many of the articles here, you’d know that we are aware of and fighting MANY issues related to public lands, not just one issue. We are not small, ineffective groups, and we are NOT being “easily dealt with.” We are MANY groups, and if anything, we are growing in numbers and strength. The wild horses are carrying the “roots” of the problem on their backs and paying with their lives. Who would you suggest that we join up with? Yes, (although I think most of us know the answer) this question needs to be asked straight to the BLM board – eye to eye and face to face – and asked over and over and over. On their website it says that reported cases will be investigated and at least two major documented cases have recently been reported … so where is their investigation? Ask them what the status is of their investigations into criminal activities by the BLM re: WH&B and when will arrests be made – and then be prepared for their schmooze answer. IMO the whole pile of BLM/USFS is filthy dirty and in order to get to the bottom of the truth it would go through most of the employees and to the top of the agency and many will be in the room with you at the meeting – members of the board and their “associates”. I would like to add that the land belongs to you too … not the BLM. Our government is stealing our land and its resources … while most of America is oblivious to any of it. 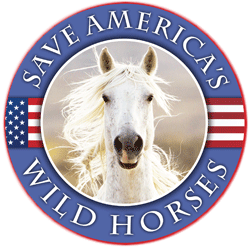 Although the wild horses and wild burros are very very very important … they are a “canary in the coal mine” and the whole mine is being poisoned by the agencies that are required to protect our wild horses and burros and our land. Yes … go get ’em! You are sooo right-on with “everything” and yes, they are our wild horses, along with the land that had been righfully given. I hope and pray, after all is said and done that justice will prevail….our wild ones deserve nothing less. My heartfelt and sincere thanks to all of those who have been fighting so diligently for their right to be free, as promised in the 1971 Wild Free-Roaming Horses and Burros Act. Surely, an alternative could be found and commonsense prevail, if those making the decisions find it in their heart to do so. We can only hope and trust that our wild ones, the American people and the land (environment) will rightfully win. Thank you RT. Thank you grandmagregg, I am sure our advocates are armed and dangerous with questions like the ones you mentioned, I also say go getum advocates………………. !!!!!!!! i so wish I could be there in the Honor of all mustangs !!!!!! I know we will be brilliantly represented………….Tomorrow must be the Force of the People for the Horse…………. Who and where is the legal entity with jurisdiction to actually investigate, arrest and prosecute? If the BLM investigates its own misdoings with a client that is more collusion plus a coverup. No authorities are claiming to side with the public against BLM and enforce the 1971 Wild and Free Roaming Horse and Burro Act. The amendments are likely illegal but have gone unchallenged. What authority can legally stand against the BLM and authorize investigations and arrests? Will someone who can do this please contact us here!? Maybe ad in classified might find someone? You sound like a revolutionary, Grandma Gregg! If the powers that be would back away and stop using the wild ones as a smoke screen for all manner of misuse of public lands and resources, and relinquish their government obligations to the wild ones and their lands, contracts, budgets and equipment and employees we would have the means to become a great little Agency of wild horse and Burro Affairs working to use science based management practices and initiate a Recovery Program for our wild captives. Endangered Species trump everything. SO WHAT! Wild horses are not a danger to sage grouse or prairie dogs! I will be watching and waiting to hear the outcome. Good luck to all who are able to go. I will be there in spirit. Well said Terri. Bless all those who are standing up for horses. Just realized that the comment I made on CNN – Erin Burnett blog is still waiting moderation – mine apparently was the ONLY comment made! Have to admit that I went on after seeing it advertised on the SAM site (she was interviewed by Erin Burnette, I think) I couldn’t view that, but read the article & made a comment – it takes 2 or 3 days to moderate??????????? Couldn’t believe no one else even went on the site. May the true spirits of the horse and burro guide you in your words and actions for what is right and for a better future where people learn to share the land and freedom with such marvellous presences! Please find someone to stand for Anne Novak’s Protect Mutangs at the press conference tomorrow. She was supposed to be part of this Press Conference. She deserves to have her very active group represented although she is not present. I am sure this is an oversight? Anne and her daughter wanted very much to be there in OK City but could not raise the funds to go. Funds were raised for others I saw. 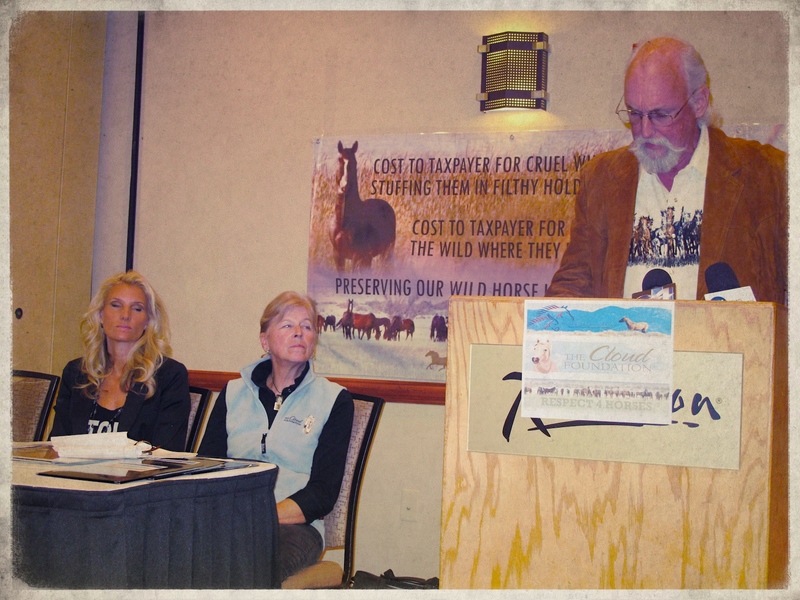 Protect Mustangs is an outspoken group with active goals that benefit wild horses. There should have been a lot of people that should have been there. PEER, Stan Olmstead, Craig Downer, the BLM Whistle blower out of Redding, CA. Hopefully they will consider this each and every time they go before any group, press conference etc. The more voices the better. Agreed that many should have been there. I still say a charter bus or two should bring people! Good luck and God sped to all those attending and speaking for our position. I too wish I could be present. However, I do feel we have great representation. I think the BLM are tired of being put on the carpet. It is our land and our wonderful horses and burros. Its unexceptable for them to think that they all speak for us. Again, I am with you in spirit and wish you the best of luck. Always a big scary disappointment!